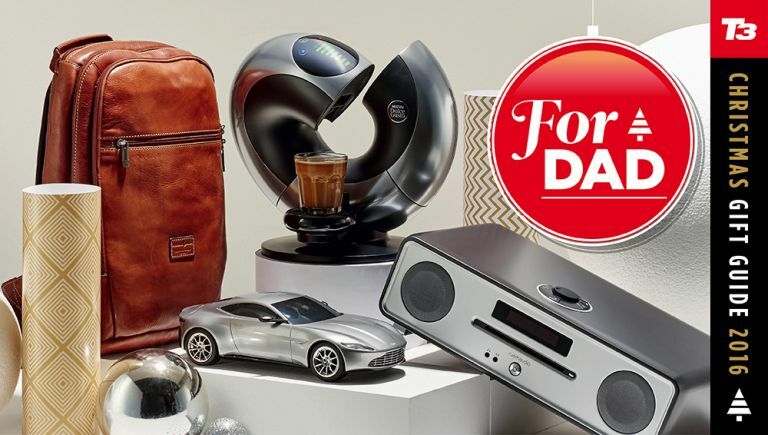 We've scored the world of tech to find the coolest and most stylish gadgets to spoil your Dad with this Christmas. And, naturally we've found the best prices for you, too. There's plenty of Dad tech to choose from, while most of them are available on the high street as well as from etailers. Don't forget to check out all of our other Christmas gift guides! Remember, Christmas is better with T3! Relive your James Bond fantasies in style with this 1:18 scale remote control car from Aston Martin. Not only does the DBS Coupé come with a die-cast body and fully-functioning doors and bonnet, it also raises your coolness factor by 17.5 per cent. A real classy number, the RFID Backpack delivers everything papa could need in terms of carrying potential, with a tall, slim design housing ample internal packing space for laptops, tablets, documents and more. Its also RFID-shielded to protect his tech and bank cards from fraudsters. The Pro-Ject Primary USB is a super and rather stylish silicone belt-driven turntable with built-in phono stage and USB output for recording to a Mac or PC. The 8.6-inch aluminium tonearm is pre-configured for the supplied Ortofon OM 5E pick-up cartridge and as we found out when we tried it, the only setting up you really need to do is to connect up the belt and attach the sturdy acrylic lid (although you'll need to move the belt from 33rpm to 45rpm should you need to switch to singles at any time). It's available in black, white or red, too (we like the red the best). A tasteful all-in-one music system with just a hint of Bauhaus, the R4-30 packages together a slot-loading CD player, DAB+ digital radio and Bluetooth streamer in a super smart satin titanium casing. Its simple, easy to use design, makes it perfect for technophobes too. Coffee connoisseurs will get a kick out of the Eclipse, with its distinctive, stand-out design, and the ability to dispense espressos and cappuccinos at the touch of a button. A touchscreen interface, energy saving mode and simple, pod-based operation round off a slick package. Cocoon is a home security device supported by Zurich and Aviva Insurance (yes, you can get a discount through Zurich). It works using sound-based technology and is controlled by your phone. The tech is powerful enough to detect tiny sounds from any room and really does work. It can stream HD video to your iOS or Android device, record audio, sound a 90db alarm (ouch), detect motion and work in the dark. Wowsers! Lay your hands on the latest Google handset and no-one can accuse you of phoning in your present-buying this Xmas. A stunning 5-inch AMOLED display, Snapdragon 821 quad-core processor and 4GB of RAM combine superbly. Want bigger? Try the Pixel XL. Get a steal on the January fitness push with the Forerunner 35, a feature-packed fitness tracker and watch. The device monitors heart rate, steps, calories and more, with pre-loaded profiles for running, cycling and cardio, making it easier than ever to get fit. If only the best audio experience will do for your dad, look no further than the P9 Signature. These headphones combine an Italian leather headband, angled stereo drivers, revolutionary drive unit, decoupled earcups and composite and aluminium cabinet to deliver superb audio reproduction. Far more than just a camera to record potential road traffic incidents, the X550 also delivers a Road Safety Warning System that provides audio and visual alerts for lane departures and collisions, cleverly reading road markings. 1080P, 30fps recording comes as standard. If dad loves spending his down time fishing, the iBobber will be a sure-fire hit. This compact sonar depth finder utilises patented fish identifier technology to wirelessly beam information back to its (free) smartphone or tablet app, making finding fish easier than ever. Now this is what we call a knife set! Yes, dad will love this series of stainless steel cutting tools designed to make chopping, filleting, slicing and cutting a butter-smooth experience. KitchenAid’s new, super sharp knives sit in a designer block that comes in a variety of different colours. Is dearest papa hairier than gorilla? Then this heavy-duty professional clipper set is a solid choice. A high-torque pivot motor delivers supreme power and a faster blade speed than standard magnetic motor clippers, while an all-metal housing ensures long-lasting durability. Drinking a favourite tipple has never been easier thanks to this compact and easily cleaned beer tap, with the dispenser compatible with any five-litre party keg. A built-in cooling unit operates quietly, with perfect pouring control optimised by a well-balanced pumping action. No, this isn’t Pixar’s loveable robot. It’s a Bluetooth-connected wallet, which remains connected at all times to your phone via the Walli companion app. If dad accidentally leaves his wallet behind, the app will notify him, displaying a map of where dad can find it. Those with large LP collections will find a perfect companion in the BT500, a turntable that offers a no-compromise approach to analogue audio reproduction. An isolated motor and belt-drive system ensure silent operation, with residual noise and vibration reduced by an aluminium platter. Winner of Wearable of the Year at the T3 Awards 2016, the Gear S2 keeps things simple with great results. A revolving bezel, slick Tizen OS and excellent AMOLED 302ppi screen combine beautifully with a 1GHz processor and 4GB of storage for music and apps. We know, nothing annoys dad more than having to get up from the sofa to turn down the lights after you’ve left them blazing. Cull the arguments by giving dad remote control via Hive Active Lights. These smart bulbs enable dad to create lighting schedules, and he can dim or turn them on or off anytime and anywhere from his mobile, tablet or laptop. A lightweight and powerful alternative to Apple’s MacBook Air, the ZenBook UX305 packs a sharp 1920x1080, non-glare FHD screen, high-speed 128GB SSD and up to 8GB of RAM. Throw the snappy Windows 10 on top and a versatile computing package is yours. Manly activities are a father’s prerogative, especially when it comes to gardening. If daddio loves getting green fingers, this ISIO cordless strimmer could make an ideal gift. A series of ‘Multi-click’ attachments, as well as a compact design, mean shrubs and grass are easily tackled. Bomber jackets are bang on trend for Autumn-Winter 2016, with this classic design from Finisterre ticking all the right boxes. The jacket boasts water-repellent, smart dry-touch fabric, an insulated PrimaLoft fill, quilted grid finish and welt hand pockets. Oh, and it also looks killer. Cleaning up after the Christmas festivities is often a chore, so why not make it easier with the D5 robotic vacuum cleaner? LaserSmart technology provides methodical navigation of rooms with any flat surface, while the included high-performance filter is easily removed for stress-free cleaning. Fans of the original Star Trek series will rejoice in this premium replica of the original Communicator device. But the Bluetooth Communicator is more than just a prop – it can be used to make and receive calls, and acts as a speaker for impromptu Tony Christie sing-a-longs with dad. The Hozelock Cloud Controller enables dad to water the garden at any time and from any place in the world, with a mobile app connecting him to the garden tap-attached device itself. Through the app he can even create automated schedules for optimum watering patterns. Dubbed by Withings as ‘the world’s most advanced scale, the Body Cardio delivers a feature-packed weight monitoring tool. Not only does the scale monitor weight, body fat, water percentage, muscle mass and bone mass, but also things like standing heart rate and general cardiovascular health. The S33 is a 2.4G helicopter designed for outdoor flight, with built-in gyro-stabilisation tech. Other features include a durable lightweight metal frame, three-channel function control that’s suitable for beginner pilots, plus a rechargeable battery pack. Help dad get the cinema surround sound experience he’s also wanted, without any of the annoying wires, with this classy 5.1 channel speaker set. An advanced spatial calibration function ensures the system delivers the best possible sound no matter what shape the living room is. A combo pack that contains two well-designed tools for easing the consumption of alcohol, the Barwise features a winding corkscrew and a magnetic bottle opener which, when put to use, allow any corked or capped bottle to be opened. Better hide that 1949 Château Latour or dad will be on it! Featuring a high-precision Japanese movement, stainless steel case back and strap, as well as -10/+20 seconds per month accuracy, the Kendrick Mesh from Kartel delivers in both the mechanics and style department. A simple, clean face and 3 ATM water resistance complete the package. Help daddio improve his swing with the Game Golf Live, a Bluetooth-enabled real-time shot tracking kit. The kit enables him to track club distances, shot dispersion patterns and get precise distances to greens, hazards and landing zones, as well as create game plans via the companion app. The big selling point with this home security camera from D-Link is its super wide, 180-degree lens that can monitor entire rooms without any blind spots. Footage is captured in 720p HD, and the hd 180 Panoramic Camera picks up night duty, too, thanks to cool night vision tech. Pizza tastes best when cooked in a stone oven. Fact. Traditionally, stone bake ovens have been very large and very expensive. Not anymore – the Roccbox is a portable stone bake oven capable of hitting 500 degrees Celsius in just 15 minutes. Now dad can ditch Dominos and hit his own pizzeria instead.